Very little is known about the life of Heinrich Vogtherr the Younger (1513-1568), except for the fact that his father was an artist who studied under Hans Burgkmair; he was once associated with the artist Bruegel; and he entered the Augsburg painters’ guild in 1541. 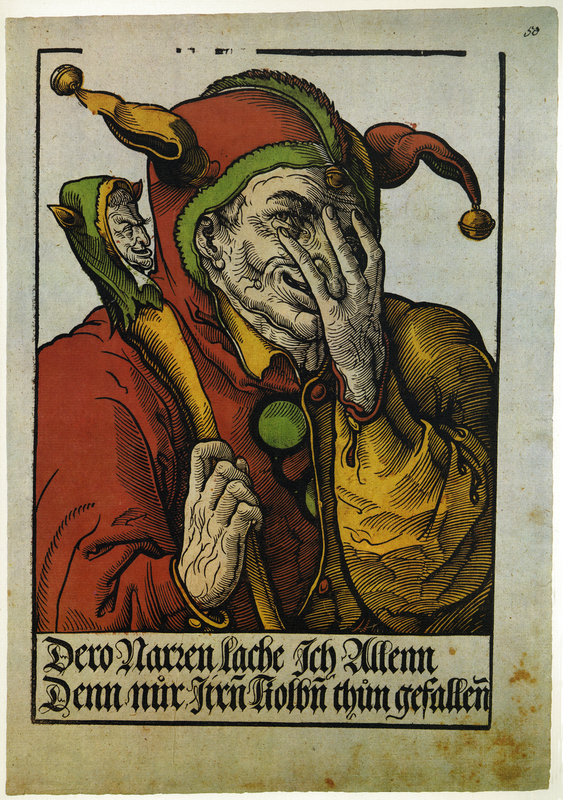 Images of jesters and fools were common subjects and here is Vogtherr’s most striking – and colourful – depiction of a fool, ‘cocking a snoot’ at the authorities. Heinrich Vogtherr the Younger, “‘Der Schalksnarr’ [The Fool], 1540. Facsimile from Flugblatter der Reformation und des Bauernfrieges,” ourheritage.ac.nz | OUR Heritage, accessed April 26, 2019, http://ourheritage.ac.nz/items/show/10394.